Now that you are familiar with the left icon panel called the Toolbar, you are ready to create the Task List. Inspire Planner allows you to attach files to tasks, create and view action items, and communicate via Chatter within the tool. For more details, see File Attachments V3. For more details, see Chatter Collaboration V3. 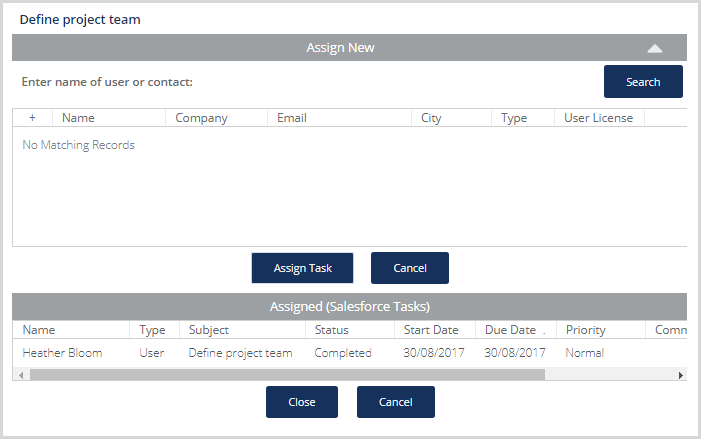 When you assign an Inspire project task to a user or contact, Inspire Planner will automatically create corresponding Salesforce tasks for those users and contacts. 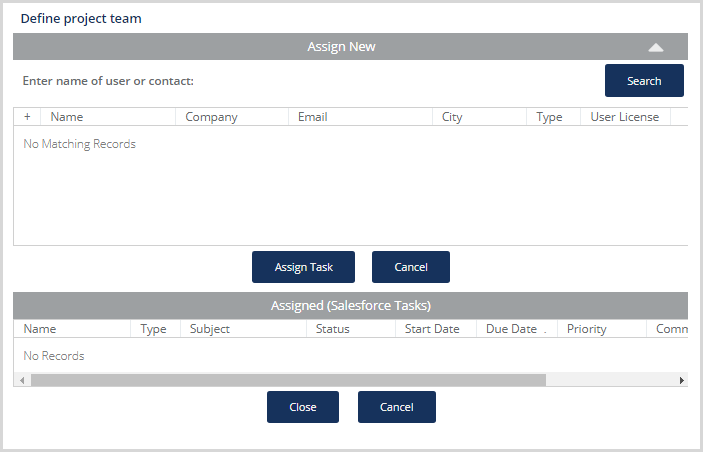 When the associated Salesforce tasks are marked as completed, this will automatically updated the related Inspire tasks to complete. 1. Click on the faded Checkbox icon of the desired task. 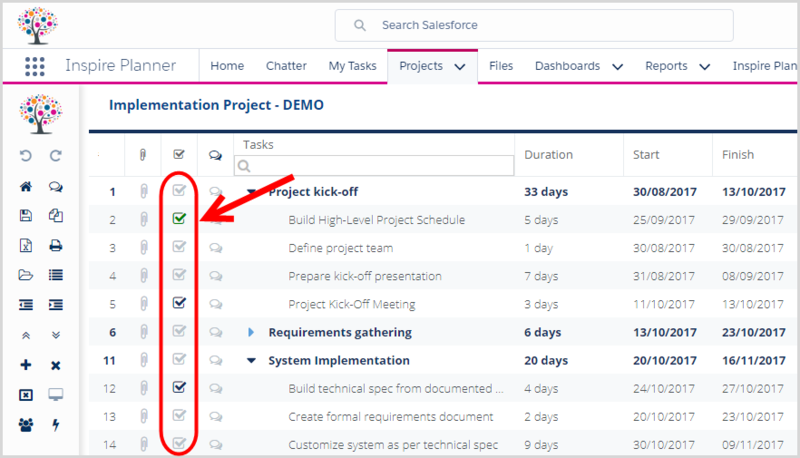 This icon indicates that status of related Salesforce tasks. This brings up the Assign Task dialog box. The columns of the Search Results List are described below. Type of Salesforce user type, to help, for instance, in identifying internal users from external community users. 2. In the appropriate field, enter the name of the user or contact whom you wish to assign the task. 3. Click Search. An entry on the list for an existing user is displayed. Please note that clicking Search without an entry on the Search field opens a list of all your users and contacts. A prompt shows if the user or contact entered does not exist. 4. 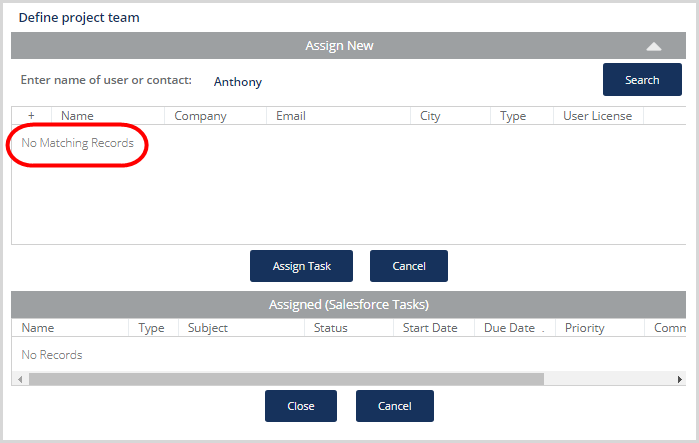 Under the + column, select the corresponding checkbox of the user you want to assign the task to, and click the Assign Task button. You can assign an Inspire task to multiple users and contacts. 5. 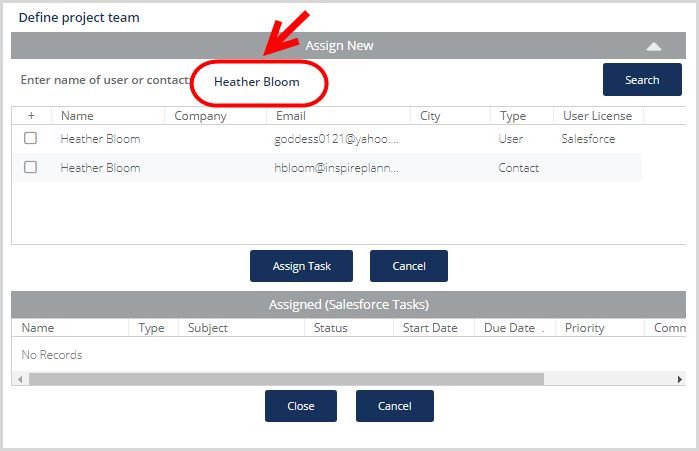 Clicking the Assign Task button repositions the user to the Assigned(Salesforce Tasks) section with populated fields. 6. You can modify the entries in the Subject, Status, Due Date, Priority, and Comments fields by double-clicking on the field. A red mark on the top left corner of the field appears if data in the field has not yet been saved. Click the Save Project Plan icon on the Toolbar, the left icon panel. 7. To remove a user from a task, drag the scroll bar to the right, and click the corresponding red X under the Remove column. 8. Click Close. Otherwise, click Cancel.